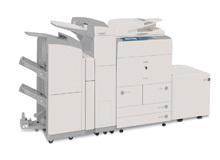 The imageRUNNER 5065 device delivers all the tools you need for professional results, with a full range of document handling capabilities, powerful print controller options, and publishing management tools for mid-to-large-sized office environments. The imageRUNNER 5065 device is powered by Canon's imageCHIP system architecture, featuring exceptional multifunctional performance and reliability. The imageRUNNER 5065 offers a full range of document handling capabilities such as a standard Single Pass Duplex Scanner/Feeder, saddle stitch finishing, 2/3-hole punching, and a Document Insertion Unit with the ability to "C" and "Z" fold documents. There's also support for advanced digital copying, network scanning, Mail Box features, as well as a choice between two print controller options, single-line fax capabilities, and the ability to distribute electronic information across a digital landscape with Universal Send. Plus, the imageRUNNER 5065 device features Canon's MEAP (Multifunctional Embedded Application Platform) technology, and a host of Internet-enabled capabilities. Operating at up to 65 pages-per-minute, the imageRUNNER 5065 is equipped with a 40GB Hard Disk Drive and 1GB RAM, providing users with exceptional productivity and reliability. Available support for actual 1200 x 1200 dpi* print resolution and Canon's exclusive Fine Character and Edge Technology (FCET) for outstanding image quality on every page. *Available with certain page description languages. Incorporating Canon's MEAP (Multifunctional Embedded Application Platform) architecture, the imageRUNNER 5065 device applications can be customized to meet unique business needs. The customized applications run from the imageRUNNER 5065 control panel streamlining document workflows. The color user interface panel and intuitively-designed device drivers provide user-friendly operation for both walk-up and desktop environments. Standard Single Pass Duplex Scanner/Feeder that scans both sides of originals simultaneously at fast scan speeds of up to 100-images per minute and a document feeding capacity of up to 100 sheets. Advanced document finishing capabilities with support for single and multi-position stapling, 50-sheet stapling, saddle-stitched booklet-finishing capabilities, post-process document insertion, "C" and "Z" folding and 2/3-hole punching. Document Insertion Unit/Folding Unit provides the capability to insert pre-printed cover sheets into job streams for enhanced productivity and the ability to "C" fold LTR-R sized documents for insertion into envelopes and "Z" fold 11" x 17", LGL, or LTR-R sized documents for easy collation into document sets. With a standard paper capacity of 4,150 sheets, users have a choice between two paper decks, including a large size paper deck with support for up to 11" x 17" size paper, to expand paper capacity to a maximum of 7,650 sheets. Incorporates Canon's IH (Induction Heating) Fusing Technology to significantly reduce energy consumption and improve productivity. Advanced Copy features such as Job Block Combination, Cascade/Remote Copy, and Express Copy help speed job programming and complete document sets. The Mail Box functions of the imageRUNNER 5065 serve as a centralized system for information-sharing, on-site document storage and print-on-demand applications. Users can choose either the Canon UFR II/PCL/PS Printer Kit-R2 or the imagePASS-S2. The Canon controller delivers printing capabilities with support for PCL 5e/6, PostScript 3 emulation, and Canon's UFR II (Ultra Fast Rendering) technology. For those users with higher bandwidth requirements, the imagePASS-S2 features its own hardware dedicated to printing applications, and supports genuine Adobe PostScript 3 and PCL 5e/6. The imageRUNNER 5065 can be equipped with an optional single-line Super G3 fax board for the ability to transmit faxes at impressive speeds. With its Universal Send technology, the imageRUNNER 5065 allows users to scan directly into the device for distribution to multiple destinations. Advanced Send modes such as Searchable PDF (OCR), Encrypted PDF and Digital Signature PDF modes can be added for an even more sophisticated solution. With Remote UI, features and functions of the imageRUNNER 5065 are controlled and accessed right from a user's desktop.